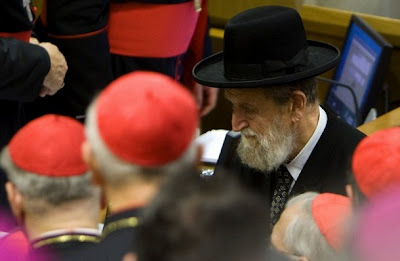 At this hour, the Synod is still being led by the afternoon-long presentation of the chief rabbi of Haifa Shear-Yashuv Cohen -- the first Jewish speaker ever to address the body. "We feel that the late pope (Pius) should have spoken up much more strongly than he did," Cohen, 80, said in an interview hours before he was due to address the gathering of Catholic bishops from around the world. 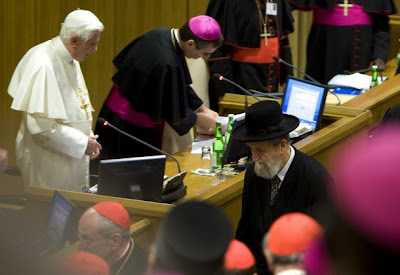 Last month Pope Benedict forcefully defended Pius, saying he "spared no effort" on behalf of Jews during World War II. "He may have helped in secrecy many of the victims and many of the refugees but the question is 'could he have raised his voice and would it have helped or not?'" Cohen said. "I did not know (the anniversary commemorations) happened during the same meeting. If I had known ... I might have refrained from coming because we feel that the pain is still here," Cohen said. "I have to make it very clear that we, the rabbis, the leadership of the Jewish people, cannot as long as the survivors still feel painful agree that this leader of the Church in a time of crisis should be honored now. It is not our decision. It pains us. We are sorry it is being done," he said. Cohen said only God knows if Pius spoke out enough against the Holocaust: "God is the judge ... he knows the truth." The Pope will celebrate a memorial Mass for his wartime predecessor in St Peter's on Thursday's anniversary. “We cannot forget the sad and painful fact of how many, including great religious leaders, didn’t raise a voice in the effort to save our brethren, but chose to keep silent and help secretly,” said Cohen. “We cannot forgive and forget, and we hope you understand our pain, our sorrow,” Cohen said, speaking to an audience of some 253 cardinals, archbishops and bishops, as well as Benedict XVI. Cohen also issued a biting, though once again indirect, swipe at Iranian President Mahmoud Ahmadinejad.